The 4890 welding glove is made of premium top grain goatskin. The supple leather contains natural lanolin that helps create a very soft feel. Characteristics include the strongest tensile strength and excellent tactile sensitivity. The best combination of flexibility and comfort. 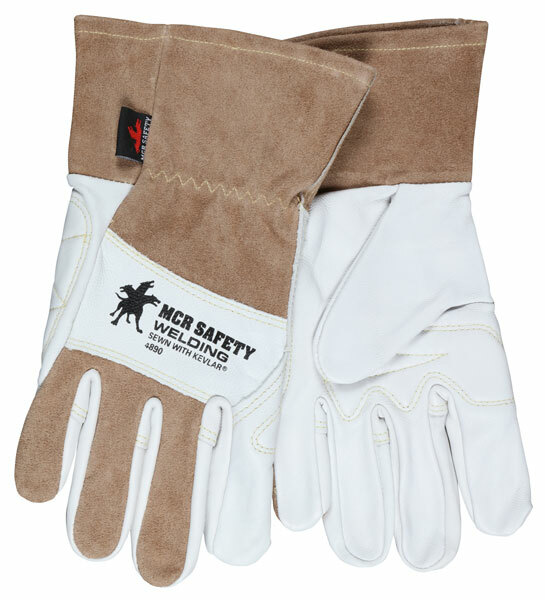 The premium top grain goatskin palm and forefinger provides excellent dexterity with durability. Other features include; a split leather back, sewn with DuPont™ Kevlar® and 2.5" brown split cow leather cuff. The Padded palm and top grain drag patch provide greater protection in the key wear areas.